Vicky, your card looks gorgeous. Love the big bow and the way you've used the pearls and crystals on the tag...may have to steal that idea !! I'm drooling Vicky what a fabulous card - love all the sparkle!! Love that bling on the bottom of the tag. Great idea. Vicky, Gorgeous!!!! I love the tag. That bling is just divine! The pearls and rhinstones together look great! 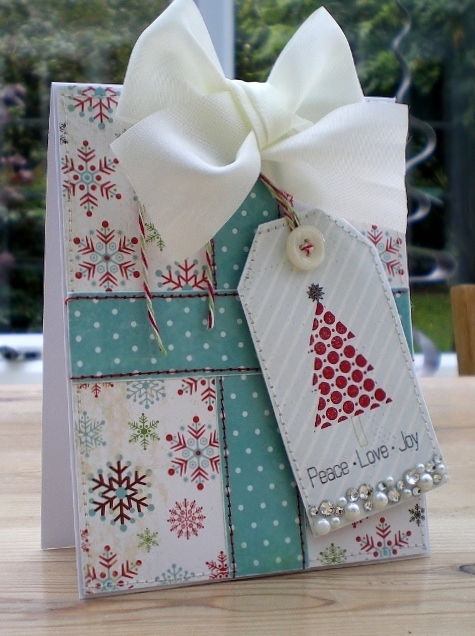 Super gorgeous card.... and I love the tag part too.... with those lush gems.... fab!! What a great idea having the tag on your card and that gorgeous bling at the bottom really sets it off. Fab card! Wow! Stunning as always Vicky. Love the colours, the bling and that fabulous bow! What a great Xmas card it is too! I love how you created the tag and the blig...oh the bling! Just gorgeous. WOW!! This is gorgeous, so much detail that draws your eye in...your mojo obviously hasn't left you for long!! ;) Love, love...LOVE it!